In a competition that kept a capacity crowd on the edge of its collective seat on Saturday, October 9, Belgium’s Philippe LeJeune trumped three other of the world’s best riders to win the individual World Championships of showjumping at the Alltech FEI 2010 World Equestrian Games in Lexington, Kentucky. 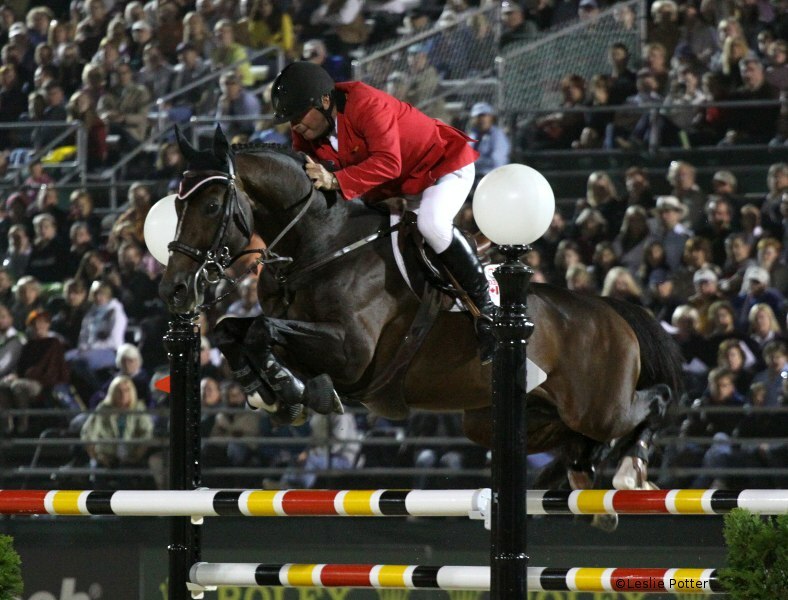 Of the four finalists – LeJeune, Canada’s Eric Lamaze, Brazil’s Rodrigo Pessoa, and the Kingdom of Saudi Arabia’s Abdullah Al Sharbatly – only the 50-year-old Belgian rider achieved four clear rounds on four different horses, to take the gold medal. He began by jumping the very substantial course set by Conrad Homfeld on his own mount, the Belgian warmblood stallion Vigo D’Arsouilles. 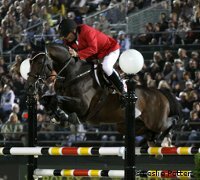 He then repeated his faultless feat aboard Pessoa’s horse, the Mexican-bred stallion HH Rebozo, Al Sharbatly’s talented mare, Seldana Di Campalto, and finally Lamaze’s Dutch-bred stallion, Hickstead, for a total of zero faults. The format of the World Showjumping Championships at the World Equestrian Games is a unique test of horsemanship. Each rider is given a few scant minutes–and two jumps–to familiarize himself with each competitor’s mount, before he has to enter the ring and prove himself over fences. Both the saddling and the warm-up were done in a cordoned-off section of the main arena, so that the audience could see every step of the process. It was evidence of the skill of the three veteran riders–and of Al Sharbatly, who is a relative newcomer to the upper ranks of showjumping competition–that no more than two rails fell in any round, and that each rider was able to coax at least two clear rounds out of totally foreign horses. Al Sharbatly began with the greatest handicap when his first trip around the course, aboard his own mare, resulted in eight faults. But the 28-year-old Saudi then turned in three clears on the other mounts, though his warm-up with the sensitive Hickstead did not inspire confidence. He would end up claiming the silver medal. In his first appearance in an individual World Championship, Lamaze summoned the cool-under-pressure style which two years ago helped him win individual Olympic gold, and Team silver for Canada, in Hong Kong. Beginning with his usual clear round aboard Hickstead, he then posted another clear with Vigo D’Arsouilles, despite the fact that he had rated LeJeune’s equine partner as potentially the most difficult horse for him to adapt to. Instead, it was Pessoa’s mount, who is physically quite similar to Hickstead, who lowered a rail in a difficult triple combination. The combination also posted a single time fault for having exceeded the 60 second time allowed. Lamaze was also unlucky with Seldana Di Campalto and lowered a rail, for a four-round total of nine faults. It was a disappointing result for the reigning Olympic gold medallist, but good enough for bronze. As for the much-decorated Pessoa, who is an Olympic gold medalist, three-time World Cup Final winner, and a past World Showjumping Championship gold medalist himself (at the 1998 World Equestrian Games in Rome), he seemed to be on track to regain his title tonight, but two successive rails with LeJeune’s horse, ‘Vigo’, left him at the bottom of the standings when added to his four-fault performance with his own horse HH Rebozo. LeJeune, a modest man who claims to love horses more dearly than humans, said his strategy was to adapt to the animals he was riding rather than try to bend them to his will. “I wasn’t going to try to ride like Eric or Rodrigo. The other three have more hot-blooded horses than my Vigo, so I decided I would go their way, not my way. Interestingly, LeJeune also rode Vigo D’Arsouilles’s sire, Nabab De Reve, to a team bronze medal in showjumping at the 2002 World Equestrian Games in Jerez, Spain. Earlier this week he was part of the Belgian team who claimed another bronze here in Kentucky. The Alltech FEI 2010 World Equestrian Games concludes on Sunday with the finals of the sports of combined driving, team vaulting, and para-dressage. Congratulations! That’s a really neat photo. What an interesting idea. I’m not sure I’d want a complete stranger aboard my horse though.